Are you thinking of switching to a healthier diet but don’t have any idea where to begin? Do you want to add more fruits and vegetables into your diet but find it a bit challenging to prepare meals due to your hectic schedule? The answer to your problem may lie in drinking low fat smoothies! Smoothies are convenient, easy to prepare, energizing and filling. Low fat smoothies are ideal meal substitutes if your objectives are to lose weight or maintain your figure. Drinking fruit smoothies regularly can lower stress levels, relieve constipation and improve mental and physical performance. Aside from being highly nutritious, smoothies are very versatile. You can incorporate and combine ingredients depending on your preference or specific objective such as detox, remedy, weight loss, muscle gain, etc. Whether you have a particular goal to achieve or you just want to get healthier in general, drinking smoothies is the way to go. Let’s say for example you don’t have time to prepare a spinach dish, or you just don’t enjoy the taste of spinach, you can just blend that nutritious leafy green into your banana smoothie and presto: you mask the taste of spinach and at the same time ensure you have your proper intake of essential nutrients! Making smoothies gives you a great chance to develop your taste and practice your creativity. You can start with simple easy to find ingredients such as a piece of banana, a pack of mixed berries, a cup of low fat milk and a cup of vanilla yogurt. Then you can start adding and combining ingredients depending on your taste or needs. For instance, if you want to bulk up those muscles and increase your protein intake, you can add egg whites to your smoothies. If you are vegan, you can add tofu, soy or brown rice protein powder for a protein-packed power drink. If you want to power up your smoothies for a highly nutritious drink, you can incorporate one or more of these superfoods that I highly recommend: Flaxseed oil. Flaxseed contains a very high level of Omega 3 essential fatty acids that effectively lower cholesterol, thereby lowering the risk of cancers and cardiovascular diseases. Acai berries. Acai has a high concentration of powerful antioxidants called anthocyanins and flavonoids which greatly neutralizes free radicals and boost cell health. Aloe vera. This is one of my favorites. Aloe vera boosts the body’s immune resistance, regulates stomach acids and stimulates cell regeneration. Not to mention, it really tastes nice with berries. Ground nuts such as walnuts or almonds. Nuts have a high content of Vitamin E and monounsaturated fats, which help lower cholesterol. There is actually no limit in making smoothies. Drinking smoothies is an enjoyable, delicious and healthy way to improve your health in a creative way. 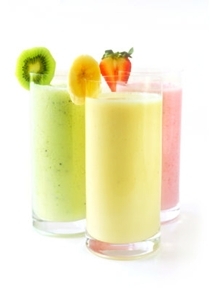 Click here for more nutritious low fat smoothie recipes that everybody will surely enjoy. And find out how you can save time and money with breakfast smoothies and learning how shop for the right ingredients for your smoothies. I hope that you found this article helpful, please also take a look at my articles on low calorie smoothies, detox smoothies and two recipes for spinach smoothie that are easy to make in your home smoothie maker too.